Basil's Blog: Does the new Dell laptop come in Baby Blue? 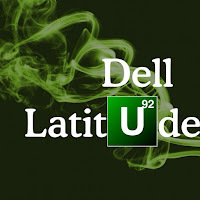 A month after the final episode of Breaking Bad, a computer manufacturer finally gets in on the phenomenon. Dell has created a laptop that smells like a meth lab. I suppose there is a market for that. But, to read the news story, it seems as if it wasn't intentional. And, maybe it wasn't. If any of the Breaking Bad series is to be believed, a lot of unintentional things happen when you get into the world of meth. Bathtubs crashing through the floor. Heads on turtles. Dead in-laws. And, apparently, the stench will not only mess up a Winnebago, but it will also stink up your Dell Latitude 6430U. Now, I'm not accusing a major computer manufacturer of dabbling in meth. Sure, they've had some financial worries of late. Now, they have a bunch of laptops they might have to recall. They should have worked out a licensing deal with AMC and Vince Gilligan and have done a tie-in. But, they didn't think about it in time. Just goes to show you that drugs will make you stupid. “Well .. here I am Sunday doing some work on the couch and my wife says ,"What stinks like cat pee?". I said ... I think its this laptop ... she puts her nose up to the keyboard and BAM! It really stinks." Damn Cats. On the other hand, like HP, Dell computers have always kind of stunk.